Al Jazeera America is owned by Al Jazeera, the Arabic news television channel headquartered in the Middle East (Doha, Qatar.) Al Jazeera purchased the Current TV channel from Al Gore, Joel Hyatt, Ronald Burkle, Comcast and DirecTV in December 2012. Current TV officially changed their name to Al Jazeera America on September 1, 2013. As I noted earlier today, Al-Jazeera has been dubbed "the most powerful voice of the Muslim Brotherhood." And Pamela Geller has noted that "Al Jazeera is the leading terrorist propaganda organization in the world. Jihad murder mastermind Anwar al-Awlaki has praised Al Jazeera, and several years ago one of its most prominent reporters was arrested on terror charges. Al Jazeera also has for years been the recipient of numerous Al Qaeda videos featuring bin Laden, Zawahiri, and American traitor Adam Gadahn. Yet they never seem to be able to trace where these videos are coming from. They have repeatedly been set up at the point of attack right before a bomb went off, so that they could take the picture of the slaughtered, dismembered bodies." The Left and the jihadis have been cooperating for years. This makes their alliance official. 6:48 p.m. | Updated Al Jazeera on Wednesday completed a deal to take over Current TV, the low-rated cable channel that was founded by Al Gore and his business partners seven years ago. Rather than simply use Current to distribute its English-language channel, called Al Jazeera English and based in Doha, Qatar, Al Jazeera will create a new channel, called Al Jazeera America, based in New York. Roughly 60 percent of the programming will be produced in the United States, while the remaining 40 percent will come from Al Jazeera English. 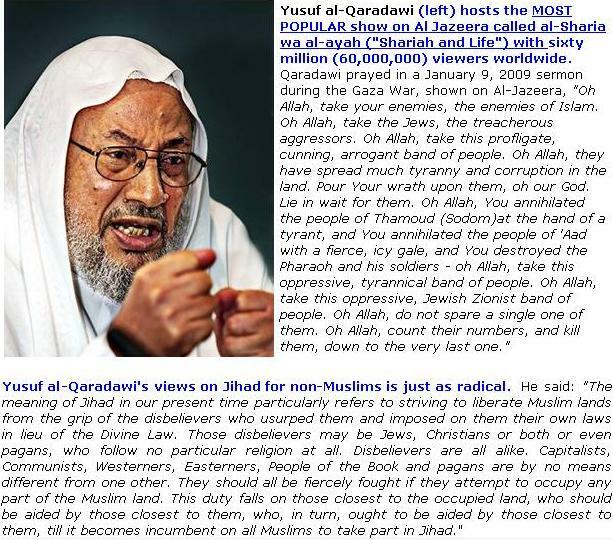 Click here to read full report at Jihadwatch.org. TheBlaze.com - Meet Al Jazeera’s Holocaust-Denying Televangelist…Is This What We Can Expect on the New Current TV? New York Post - Eliot Spitzer quits Current TV after purchase by Al Jazeera. Fox News - Current TV staffers rip Al Gore for sale to Al Jazeera. New York Post - Current situation: Staffers talk about first meeting with Al Jazeera – Some wanting to resign. AT&T states in their July 24, 2015 News Release: AT&T Inc. (NYSE:T) has completed its acquisition of DIRECTV. The newly combined company – the largest pay TV provider in the United States and the world – will offer millions of people more choices for video entertainment on any screen from almost anywhere, any time. DirecTV boasts of surpassing 30 million subscribers in the United States and Latin America, more subscribers than any cable company inside the United States. Therefore, AT&T/DirecTV have the capability of delivering Al Jazeera America into more homes than any company in the United States. The ranking of cable companies by their number of cable subscribers is posted below. Cable company rankings by the National Cable & Telecommunications Association. Florida Family Association has prepared an email for you to send to encourage AT&T/DirecTV officials to put America first by dropping Al Jazeera America. To send your email, please click the following link, enter your name and email address then click the "Send Your Message" button. You may also modify the subject or message text if you wish. where he will run both DIRECTV.